This post is Part 5 of a series to augment the Atlas of the Known World available for free download. Start with Part 1 here. Towering black pines of the faeries. You voted The Forests of Kalrein winner of April 2015 by 94%. 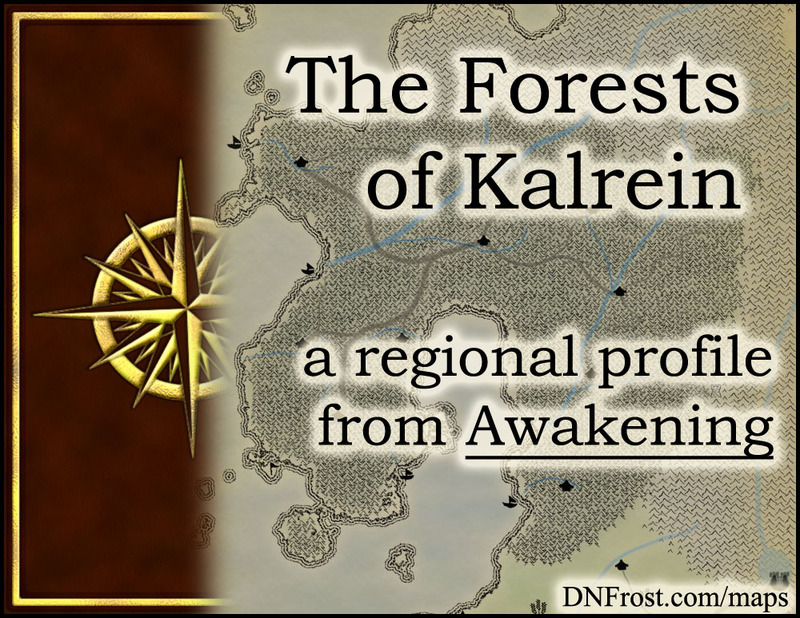 In Chapter 3 of Awakening, the Forests of Kalrein lie north of the Front Rishi, filling the western reaches of Allana. The black pine forests are deep and dark, stretching west of the D'jed Mountains and forming the southern border of the Draconans. Springs are rainy and summers warm, but autumn brings cold downpours and snow crusts the winter pines. This region also borders the Plains of Rishi, the Great Sea, and the North Sea. The black pines of Kalrein support a flourishing food chain. Insects, birds, and small woodland creatures thrive off the cones of the pines, as well as berries and other underbrush. Larger animals like the speckled wyvern and heart-tail deer meander through the dappled shade, avoiding predators like the black-tipped fox and the stark wolf, which hunts in packs up to twelve strong. The faeries of Kalrein are a small people, with adults standing about four feet high. Their skin ranges from green to violet, mostly in bright or pastel hues, and they sport two sets of gossamer wings that allow them to fly. They have short ears with backswept points that are often pierced, especially for women. Faeries are skilled tanners and tend to dress in all manner of leathers, usually in muted or natural colors. Both men and women tend to have open-backed garments allowing their wings freedom of movement, though women's clothes are typically laced up the front whereas men's clothes tend to button or hang open. Kalrein faeries have a long-standing blood feud with the neighboring mountain elves, and they can usually collect a bounty for turning in the severed right ear of a mountain elf. Faeries have strong air magic, which is what ultimately allows them to fly. They tend to be somewhat adept at their latent water magic as well, and the combination of these two elemental magics gives them a profound mastery over the tanning process. In exchange for such powerful elemental magics, faeries tend to have average sensory and special magics. For Kalreini faeries, Intent magic tends to outweigh Scent magic, but both are weak enough to not allow for any real latent powers to arise. The Kalreini faeries value independence and tradition, and they tend to be a fairly isolated people who do not travel nor take kindly to outside visitors. Though generally even-keeled, faeries become rather hostile towards visitors, even faeries from other regions of Kalrein. Yellow and brown are viewed as the colors of magic, as faerie skywriting tends to be one of these colors. Families are matriarchal and trades, particularly hidecraft, are handed down from one generation to the next. Though part of the Allanic Empire, Kalrein is self-governing and pays its dues to the empire while enacting its own laws within the forest. Each village has its own chieftain and establishes its own council where members of influential families preside over legislation and the hearing of local grievances. The chieftain acts as tie-breaker and ultimate decision-maker. Faeries measure their age in years, with the new year on the winter solstice as set down by the ancient mer calendar. However, the vernal equinox used to mark the new year, and spring celebrations are held throughout Kalrein, though they are no longer considered new-year festivities. Children come of age when they reach sixteen years old, and depending on a family's wealth and class, the coming-of-age may be celebrated with a small family feast or a large social gala. As adults, faeries are expected to take up the family trade or at least enter into an apprenticeship for some trade. Families with seats on the village council also expect their members to promptly wed and produce heirs to continue the governing line. Failure to do so is punishable by social ostracization rather than legal retribution, except in the case of some chieftain heirs, who are forced on a pilgrimage to find and wed a spouse before they can take up the chieftain position. Though Kalrein has no mounted riders, all adults are expected to render services of guard duty, patrolling the mountain borders on the lookout for the elves with whom they feud. The eastern realms of Akveld and Klizveil, which border the elven D'jed, are home to the fiercest warriors, many of whom render guard duty services as their full-time profession. These warriors are viewed as the pride of Kalrein, and there is no honorable way to leave one's family trade except to take up the sword against the mountain elves. Normal life in Akveld revolves around ranching, and many full-time warriors retire to wyvern ranches to serve as private security once their days of border patrol are done. Kalrei is the ancestral language of the faeries, though it has been replaced with Allanic in most Kalreini homes. It is written with a flat chisel in a series of alphabetic runes comprised of short lines and dots. Though Allanic is the spoken language of Kalrein, the faeries still use their ancestral alphabet for writing, and they have adapted several of their runes to represent Allanic sounds not found in Kalrei. Now only spoken during rituals and ceremonies, Kalrei sounds flighty and musical to an Allanic speaker, with three distinct tonal ranges and rhythmic oscillation of stressed and unstressed syllables. 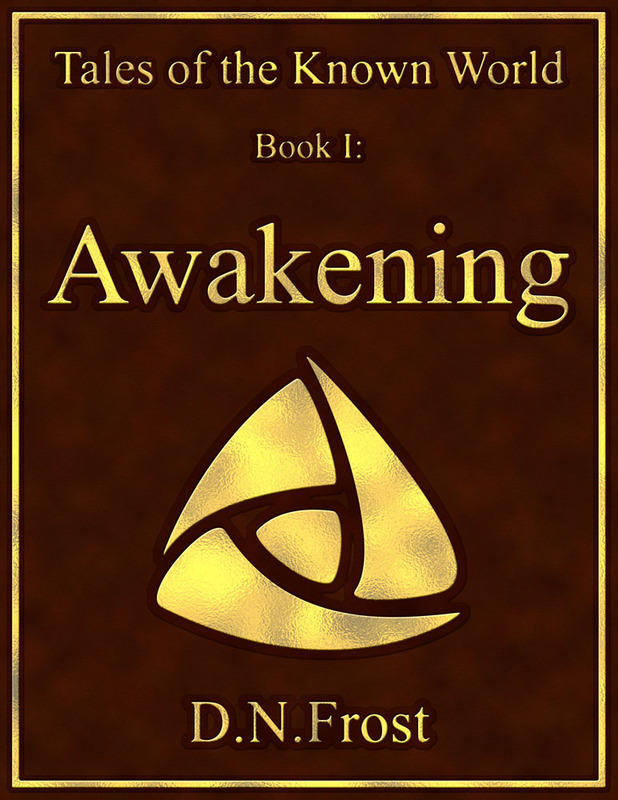 In the book Awakening, Vithril is a faerie from the forests of Kalrein. 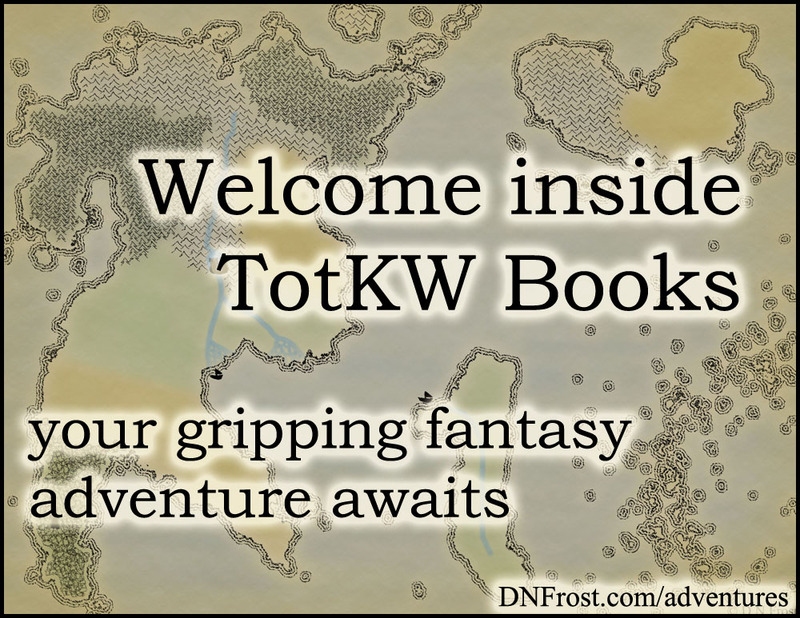 While on a journey to visit the faeries on the other side of Allana, Vithril encounters a little boy named Darek and his guardian Kingard. Bound by a faerie curse to follow Darek wherever he goes, Vithril abandons her planned pilgrimage and flees with her fugitive company into the dreaded D'jed Mountains. With only Kingard's word as protection against the local mountain elves, Vithril must join their quest to reach the mythic city A'lara before it's too late.